Vypeen is situated on the western side of Kochi. The Island is demarcated by a sea coast of 26 Kilometers on the West and backwaters extending around 30 Kilometers on the East. It has a land area of about 87.85 Sq. kms. Vypeen is linked to Kochi via the new Goshree bridges. The Vypeen-Munambam road, which divides this Asia's most densely populated Island into two stretches, i.e., the Western stretch, which is coastal-belt, and the Eastern-belt, which is closer to the Backwaters. The Dharmadam Beach is 17 Km from Kannur. The small 5 acre island covered with coconut palms and green bushes is a beautiful sight from the beach. Willingdon Island is the home of the modern port that serves Kochi in Kerala, India. It is a man-made island created from the materials dredged while deepening Kochi Port, its in Ernakulam district of Kerala in south India. Its named after Lord Willingdon, the erstwhile governor of Madras who had a hand in the project. Robert Bristow, the chief protagonist and engineer for the project owned the first building on the island. The first liner, which belonged to the Bibby Line, arrived at the island on the 9 March 1935. A port hostel had been purposely built to accommodate any passengers who wished to rest for a few nights. The hostel was soon afterwards named the Malabar Hotel. Ezhumanthuruthu is a small "thuruthu" ie island situated 8 km. west of Kaduthuruthy town.It falls in Kottayam district, the city of letters. It is a densely populated place of Kaduthuruthy Gram Panchayat. Population comes around 3500.Area comes about 2square kilometers.It is a twin "thuruthu" comprising of the main land Ezhumanthuruthu and another small thuruthu called Pulithuruthu.The adjoining place to the east is the famous Ayamkudy and on westwards the popular water logged place of upper Kuttanad known as "Mundar estate". The populace of Ezhumanthuruthu is 90% of agriculture labours and small or medium farmers. One can reach Ezhumanthuruthu straight from nearby town Thalayolaparambu by road of 5 kms.or from Kaduthuruthy town. The nearest railway station is Kaduthuruthy railway station. It is about 6kms away from this place. Long ago, the place was surrounded by rivers. Now any one can access through road. Pulincunnu is an island in the Pamba River in the state of Kerala, in southern India. Pulincunnu is located in the Kuttanad region of Alappuzha District. The scenic beauty of the wide river ride through the Pampa river is the reason why this route is one of the most favoured by houseboats tourism operators in Kerala. It is part of the Kerala Backwaters, a network of lakes, wetlands, and canals. It is part of the Kerala Backwaters, a network of lakes, wetlands, and canals. The famous Rajiv Gandhi Trophy boat race is held here every year during the months of October-November. Valiyaparamba is a small island in the Kasargode district of Kerala state, south India. . One of the main tourist spots of the District. This is an island in the Arabian Sea. An ideal place for picnic also a fishing centre. It is 5 km south west of Cheruvathur separated from the mainland by back waters and about 30 km from Bekal,Kasaragod, north Kerala. Valiyaparamba is perhaps the most scenic backwater stretch in Kerala. Fed by four rivers and dotted with numerous little islands, Valiyaparamba is fast turning into a much favoured backwater resort that offers enchanting boat cruises. Valiyaparamba,a hinterland separated from the mainland, is a noted fishing centre in the district and is just an hour's drive from Bekal - one of the most enchanting beaches of Kerala. The Bekal fort which stands on a headland that runs into the sea offers a spectacular view of the surroundings. The little island of Pathiramanal, on the Backwaters is a favourite haunt of hundreds of rare migratory birds from different parts of the land. 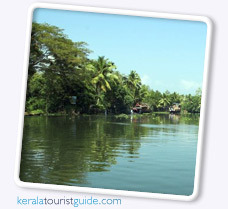 The green island forms an ideal place for a break in the journey while on a backwater cruise. The mainland Alappuzha has a vast network of lakes, lagoons and fresh water rivers criss-crossing it and is a district of immense natural beauty.